Montana Man Found Guilty Of Killing German Exchange Student : The Two-Way Markus Kaarma shot 17-year-old Diren Dede, who had entered his garage, over the summer. The case was a test of the state's "castle doctrine," which says a man's home can be defended like his castle. Markus Kaarma waits to be dismissed during an afternoon break in Missoula County Court in Missoula, Mont., in this Dec. 5 photo. 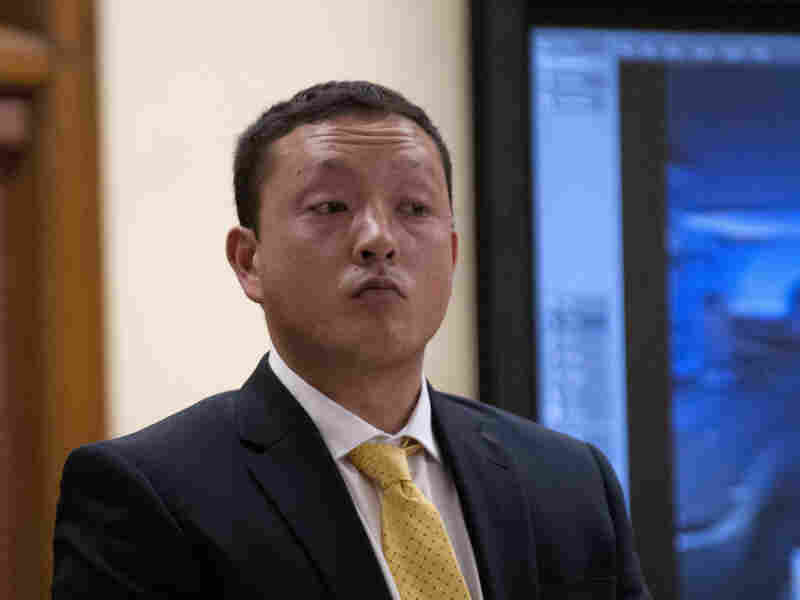 A jury found Kaarma guilty Wednesday of deliberate homicide in the shooting death of a German high school exchange student who entered his garage. A Montana man's shooting in April of a German exchange student was a test of the state's "castle doctrine," which says a man's home is his castle and can be defended as such. But on Wednesday, a jury convicted Markus Kaarma of deliberate homicide in the death of 17-year-old Diren Dede, who was in his garage. As Montana Public Radio's Christopher Allen reports, "Kaarma's defense team argued deadly force was justified because he was defending his home. Prosecutors argued Kaarma, who had been previously burglarized, set a trap with intent to harm and committed deliberate homicide." On Wednesday, a jury agreed with the prosecution. The Associated Press reports that cheers erupted when the verdict was read in the courtroom. Dede's parents hugged and cried. Kaarma, a resident of Missoula, Mont., faces a minimum of 10 years in prison when he is sentenced on Feb. 11, 2015. His lawyers said they would appeal. As we previously reported, Dede, from Hamburg, Germany, was unarmed at the time of the April 27 shooting, but he may have been engaged in "garage hopping" – a local tradition in which teens duck into open garages in search of beer or pot. Laws like the "castle doctrine" – and "stand your ground" – have come under scrutiny following the shooting death last year of Trayvon Martin.